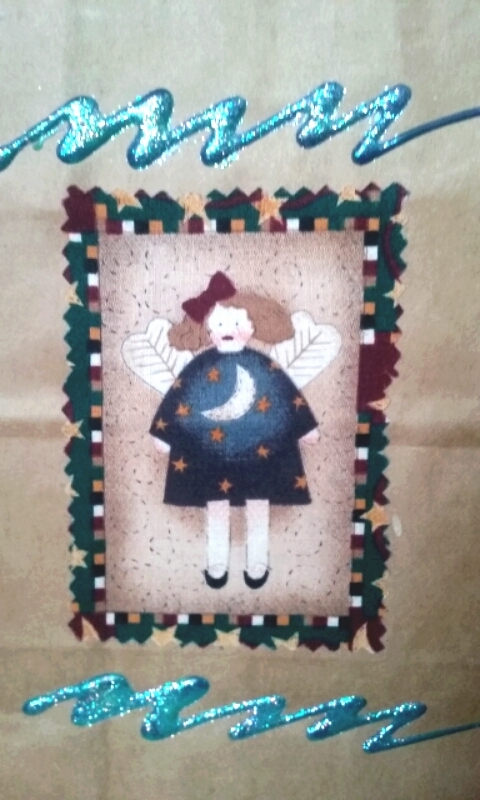 Years ago, a friend of mine gave me a gift in a bag that was basically homemade. 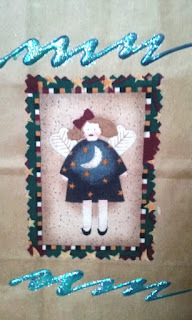 Well, the bag wasn't (it was your basic kraft paper bag) but the embellishments on the bag itself were her own creations. I loved it! Of course, I wanted to make some myself to place Christmas gifts in. At the time, you could buy patterns for various holiday bags. 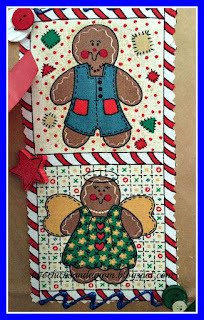 Christmas, Easter, Halloween, and even birthday or new baby gift bag patterns. 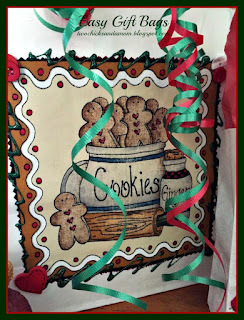 I do have a few of those and have used the patterns but I discovered a couple of quick methods to decorate a bag. 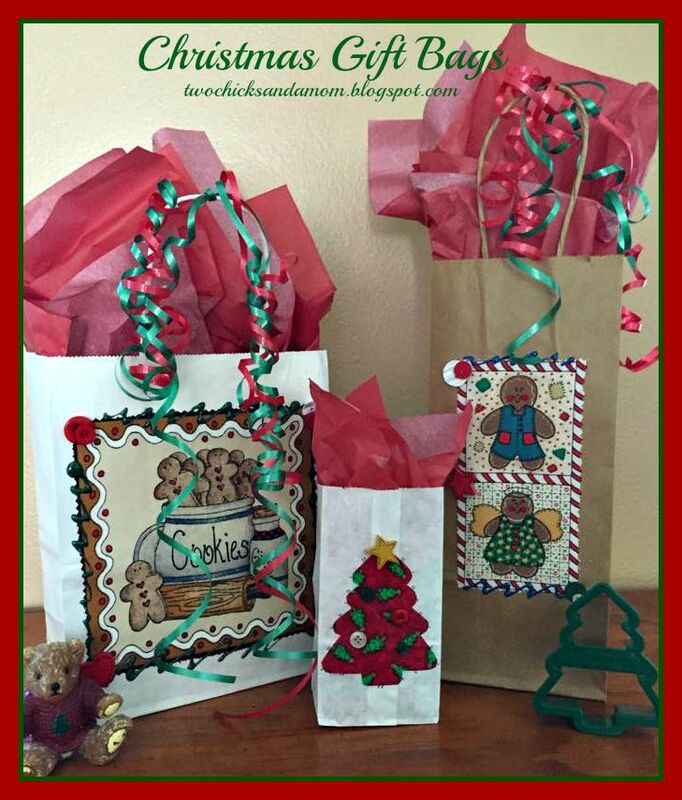 Plain gift bags (kraft-colored, white bags or any solid colored bags) with handles preferably. Size of bag dependent on gift. Cookie cutter. Yes, cookie cutters. 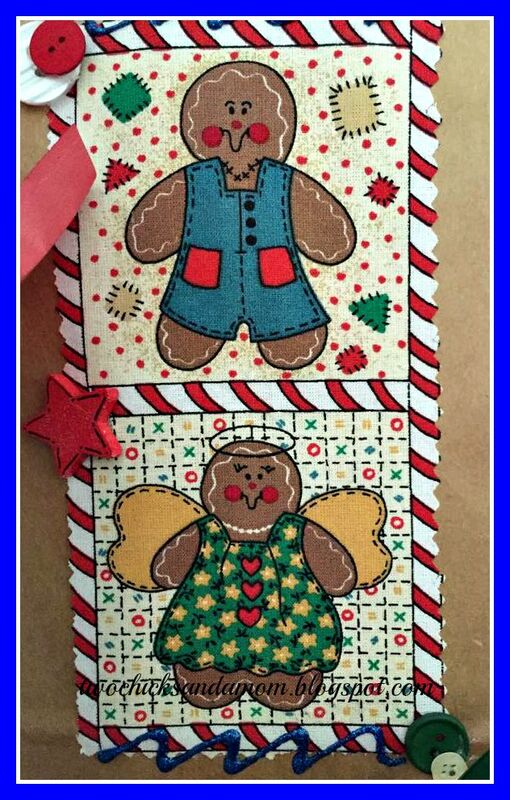 Christmas tree, Star, Gingerbread Man, Black Cat, Balloon, etc. 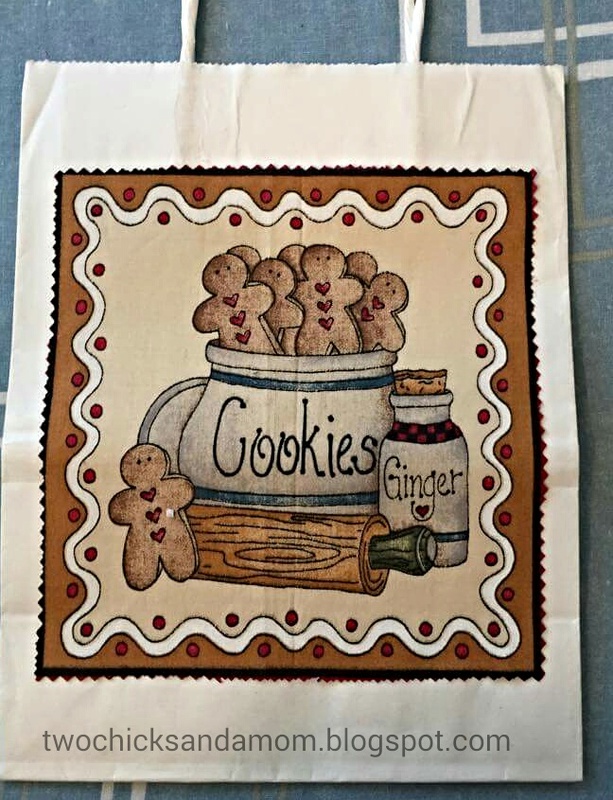 You can also use various other templates you may have for crafting or from a pattern to make the main design for your bag. Oh, yeah, you will need your ironing board and iron. Choose your fabric and design. Place wrong side of fabric against webbing (adhesive) side of Wonder Under. Lay on iron board and with hot iron fuse the two pieces together. 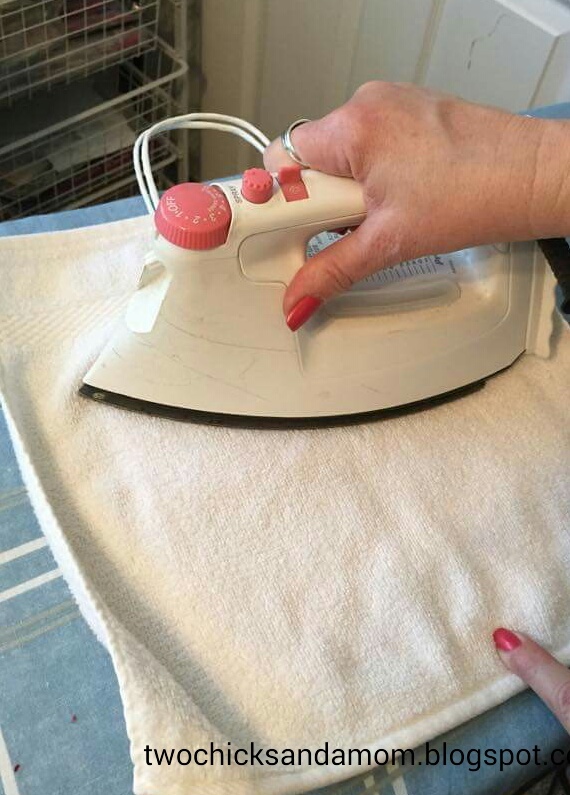 Hold the iron over the fabric in several places until fused completely, 15 to 30 seconds depending on iron. Allow to cool for a minute or two. 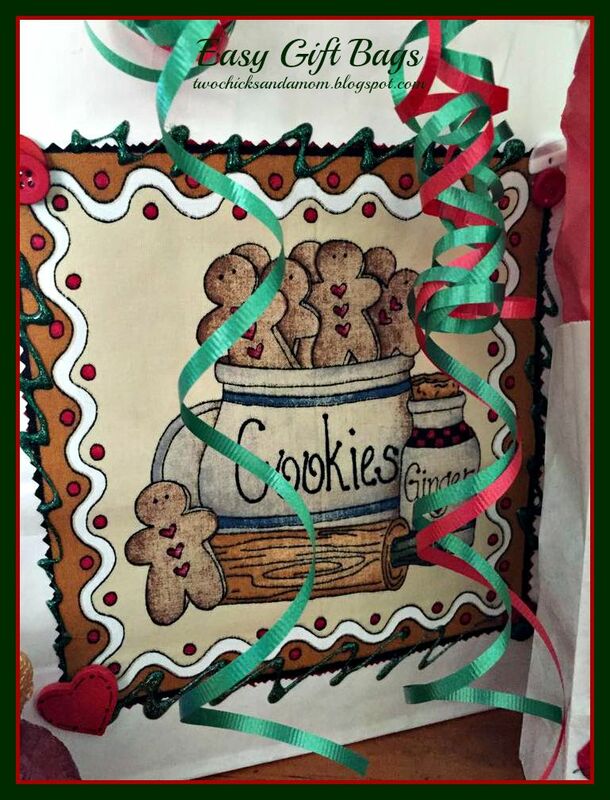 When cool, take your cookie cutter, template and place on paper backing of Wonder Under. Hold in place and trace with a pen your desired shape. Using sharp scissors (as opposed to dull haha) cut out your traced shape. 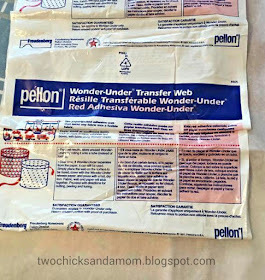 Carefully peel off the backing of the Wonder Under. You should then have the visible webbing on one side, the right side of your fabric on the other. 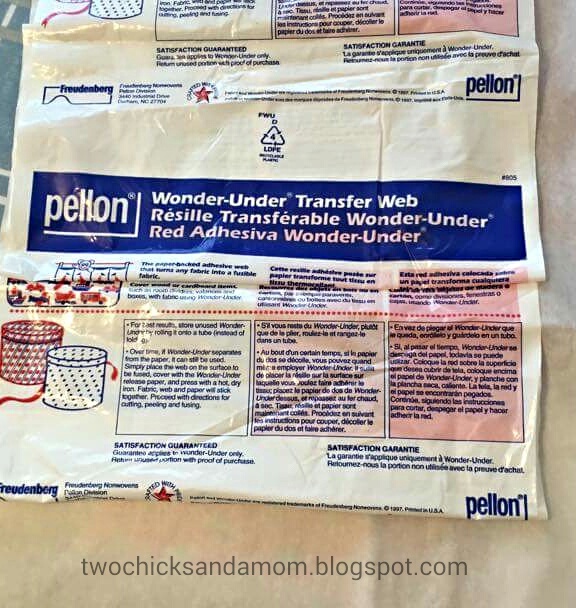 Place the adhesive side against your bag--make sure you have it in the exact place you want it--once fused it really doesn't come off well. 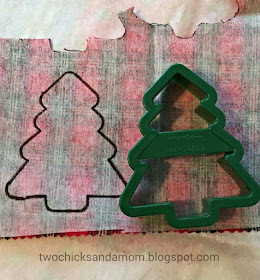 Place a light cloth, such as a wash cloth over the bag/shape and then press firmly down over area for 15 seconds or so. Repeat in all areas if larger than size of iron. 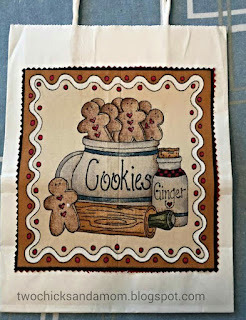 Remove cloth and allow bag to cool for several minutes. When cool, check to see if all areas are fairly well adhered. Now it is time to decorate! Use your imagination, use your supplies! My little bag with a small Christmas tree doesn't need a lot so I opted for "stitching" marks that I made with a scrapbooking pen. 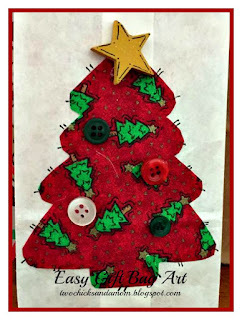 I also added a small wooden star that I painted, added "dot dash dot" pattern to and a few button "ornaments". I used a hot glue gun to place. Another easy method is to buy material which has panels on it and fuse those to a bag. I like to use pinking shears to get a more interesting edge. Then iron the panel onto the bag with the Wonder Under. This time I used colored hot glue sticks to embellish the edges of the material. 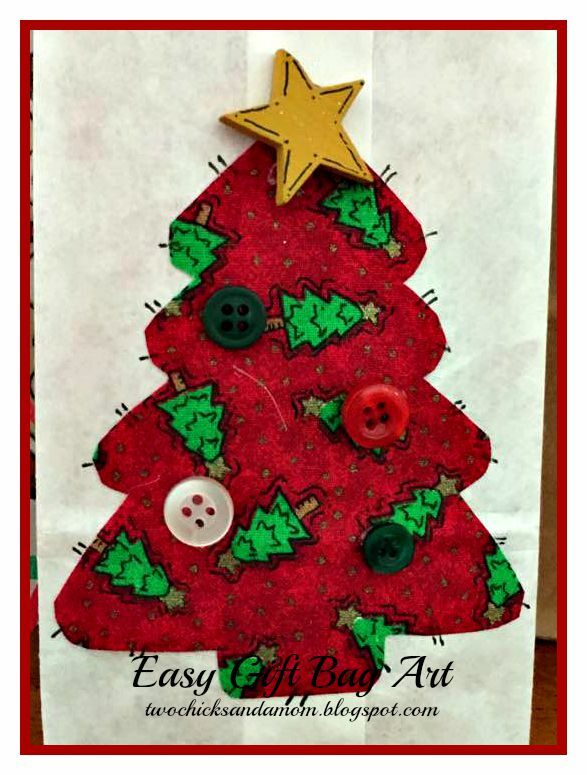 Of course, you don't have to--you can make your bag however you want. I also hot glued some buttons and a wooden heart onto mine. The finishing touch? Why, coordinating tissue paper and curling ribbon! 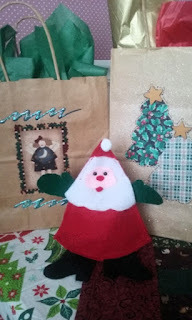 I have a couple of bags tucked away in my Christmas decorations that I use as part of my holiday decor so they make nice centerpieces or just placed on the mantel. One year I made a variety of bags for a friend and gave those to her as a gift so she would have gift bags throughout the year. She loved that, too!